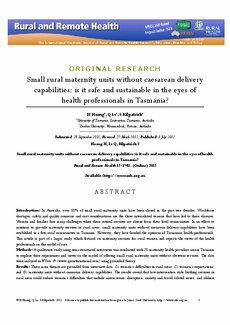 eCite - Small rural maternity units without caesarean delivery capabilities: is it safe and sustainable in the eyes of health professionals in Tasmania? Introduction: In Australia, over 50% of small rural maternity units have been closed in the past two decades. Workforce shortages, safety and quality concerns and cost considerations are the three interrelated reasons that have led to these closures. Women and families face many challenges when these critical services are absent from their local communities. In an effort to continue to provide maternity services in rural areas, small maternity units without caesarean delivery capabilities have been established in a few rural communities in Tasmania. However, they have divided the opinions of Tasmanian health professionals. This article is part of a larger study which focused on maternity services for rural women and reports the views of the health professionals on this model of care. Methods: A qualitative study using semi-structured interviews was conducted with 20 maternity health providers across Tasmania to explore their experiences and views on the model of offering small rural maternity units without obstetric services. The data were analysed in NVivo v9 (www.gsrinternational.com) using grounded theory. Results: Three main themes are grounded from interview data: (1) women's difficulties in rural areas; (2) women's expectations; and (3) maternity units without caesarean delivery capabilities. The results reveal that low-intervention style birthing services in rural areas could reduce women's difficulties that include access issues, disruption, anxiety and travel related issues, and address women's expectations in term of access to local services. However, this model is less likely to meet women's safety expectations, especially in emergency situations. Conclusion: The findings of this study offer insights for policy-makers and state government with regard to the future planning of this model of care. It is recommended that safety and sustainability issues should be considered when this model of care is to be implemented in other rural communities. Australia, maternity care, rural Tasmania, rural women, small rural maternity units.